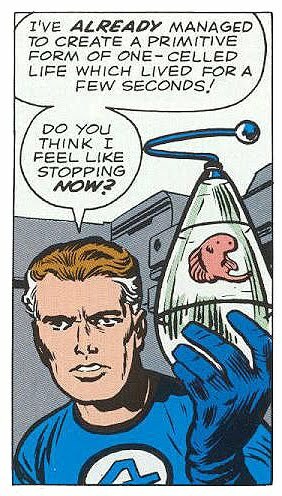 Continuing the rollout of villainous Marvel mainstays, this issue introduces The Mad Thinker, clearly meant to be yet another foil for Reed Richards. Granted, they could have poached The Wizard from Johnny's solo adventures - though he'll be seen in these pages soon enough - and even Sue Storm offers her commentary on the matter: "Good grief! Another power-mad genius for us to contend with!" 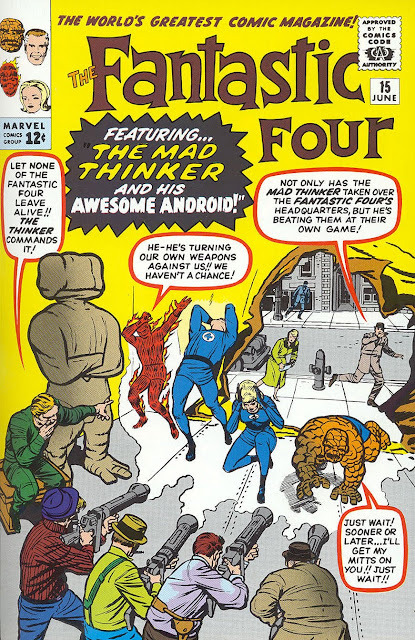 And in one of Marvel's more blatant tributes, The Thinker (no one actually calls him "The Mad ..." inside the book) is obviously modeled on Rodin's renowned sculpture of the same name; in addition to the instance on the cover, above, the character is seen at several points within the book sitting in that famous pose, chin resting on hand. The Thinker may be Mad ... but he's polite enough to bring out snacks for his crew! So here's The Thinker's shtick: With the aid of powerful computing machines (as large as a room, of course), he's been able to gather data on everything that has ever happened, and thus can predict anything that that ever will happen. Anyone with even a passing interest in philosophy (or science) will, of course, recognize this as a clever riffing on determinism, and specifically Laplace's demon. Unfortunately, even as a child I could tell the concept, as presented, didn't quite work. 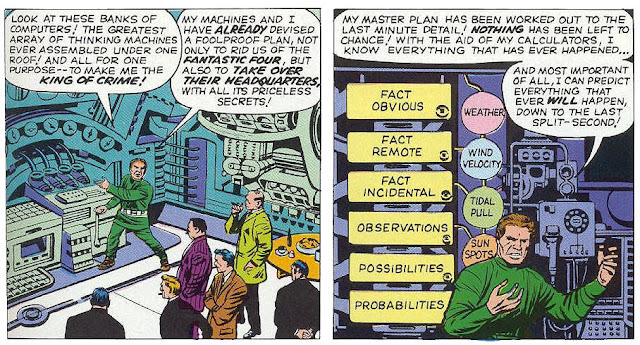 See, the other half of the Thinker's shtick is that he's always undone by being unable to predict some action taken by our heroes or a side character; he just couldn't account for "the x-factor", "the human element". Except that at various other points in the story he clearly has, such as when he evaded police because he knew a hot dog vendor would pass by at just right moment. Essentially, the weakness of the character is that he can supposedly predict all sorts of events and human behavior to an uncanny degree ... up until the point when, y'know, the writer needs the story to end. he's got a pretty Awesome visual. But The Mad Thinker isn't the only new character we meet, as we're also given the Thinker's creation, the Awesome Android! 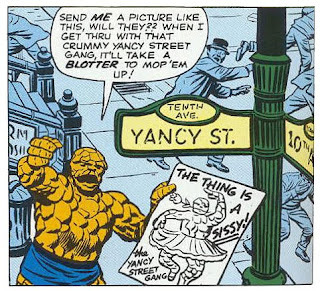 Although the "Awesome" part of the name may be Stan Lee's typical hyperbole being stretched even further than usual, as the creature is big, strong, can expel a mighty wind from its mouth, and mimic certain textures. 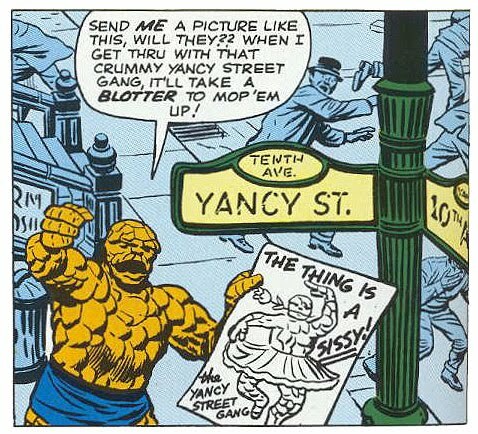 Not exactly the most amazing set of abilities, and he won't really become a fan-favorite until he's revitalized in Dan Slott's 2004 She-Hulk series, as office temp "Awesome Andy". 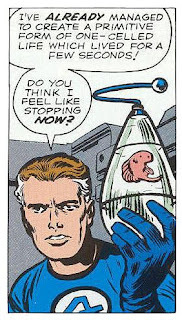 In fact, the most alarming thing about the Android is usually glossed-over: that the Thinker created him from Reed Richard's notes on creating artificial life! Yes, that's right - Reed's been playing God. No need for committees on scientific ethics here! Step One in Reed's journey to Mad Scientist Extraordinaire.